Organized by 24 ORE Cultura – Gruppo 24 Ore and curated by the Ny Carlsberg Glyptotek, Copenhagen, the exhibition “Gauguin. Tales from Paradise” features approximately 70 works from twelve international museums and private collections, together with artefacts and pictures documenting the places visited by the artist. 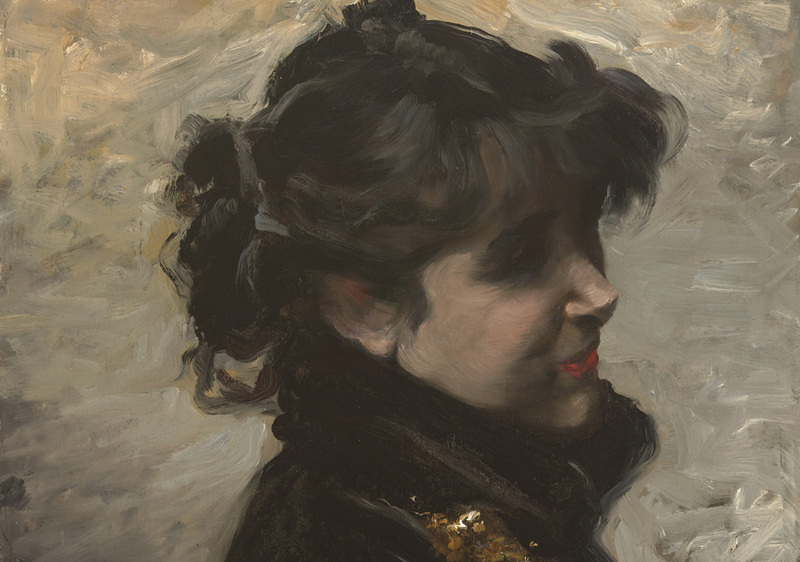 Next spring the Glyptotek will show a version of the exhibition back in Copenhagen, based on the experiences of this Danish-Italian collaboration. The Glyptotek collection of works by Paul Gauguin is one of the world’s most comprehensive, and this exhibition features no less than 35 of the Danish museum’s Gauguins – along with significant works by Cézanne, Pissarro and Van Gogh. It is the first time that such a large part of the Glyptotek Gauguin collection is displayed outside of the museum. 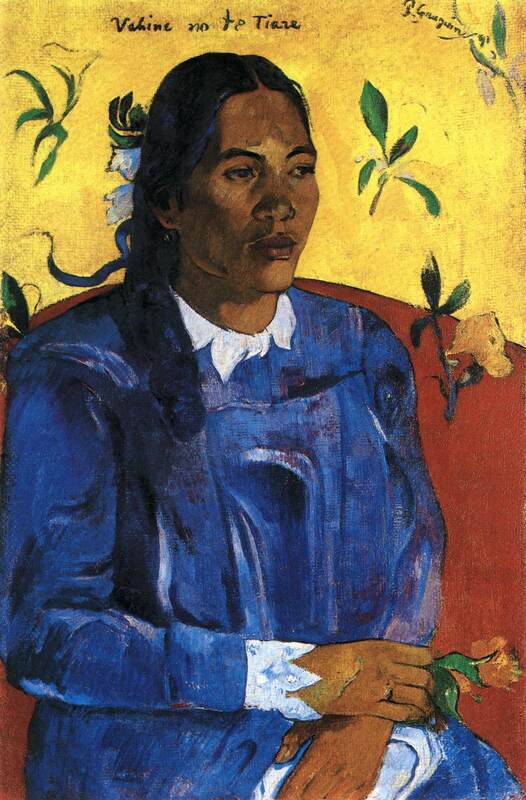 Vahine no te Tiare (Woman with a Flower), one of the first paintings which the artist sent back to France from Tahiti in 1891, as an ambassador of a new and radical art, “made in Polynesia”. and Volpini Suite (Statens Museum for Kunst, Copenhagen). The art works on display will allow visitors to recognize and analyse the sources of Paul Gauguin’s art, which range from the folk art of Brittany to Egyptian, Peruvian, Cambodian and Javanese art, to the life and culture of Polynesia. By examining some of the artist’s masterpieces in the light of these sources of inspiration, the exhibition aims to illustrate his peculiar and original approach to “primitivism”. Through the display of a series of works and artefacts created by Paul Gauguin during his travels – real and imaginary – the exhibition aims to highlight the originality of his life-long quest for “the primitive”. Gauguin's interest in other cultures took the form of a constant search for original material that could be integrated and merged with his own creations. 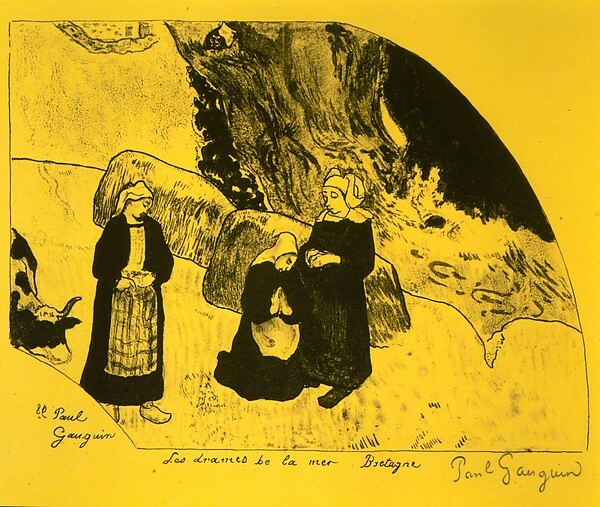 Ranging from paintings and wooden sculptures to ceramics and engravings, the works illustrate Gauguin's “primitivism” as an artistic vision, lifestyle and journey to escape from contemporary society, in the pursuit of a different world, a pristine one pregnant with ancient meanings and inhabited by ancestral powers and spirits. The variety of artistic means of expression employed by Gauguin is itself proof of the creativeness and complexity of his vision. 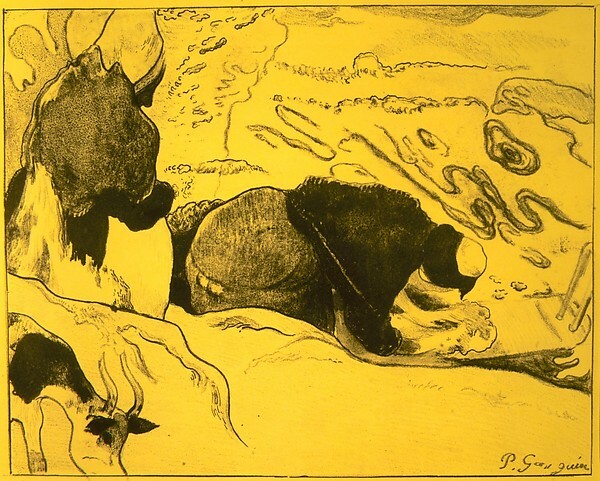 The works on display show how Gauguin's imaginative and unique approach may serve as a prism through which to rethink the conventional Western view of “primitivism” according to new and unexpected perspectives. 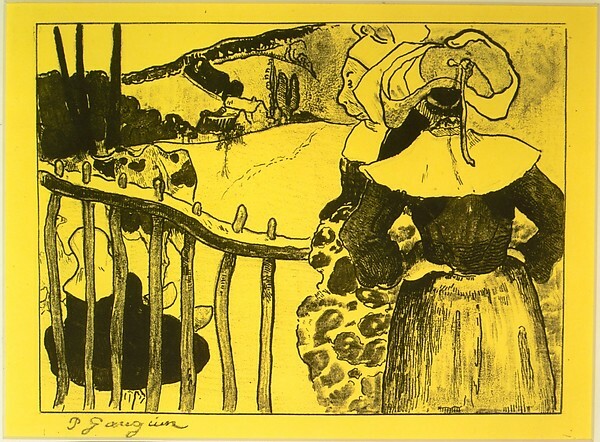 Paul Gauguin's fascination with “the primitive” represents a recurrent theme in his artistic production. 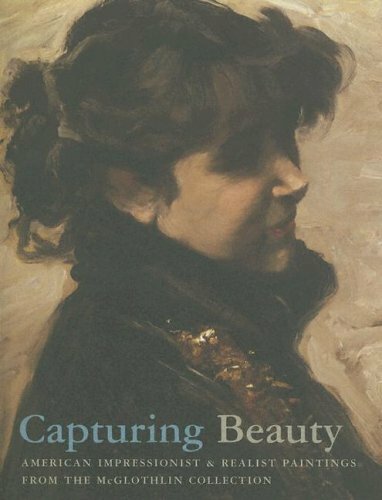 His approach springs from a deep-seated desire to make a break with the conventional rules of the society of his day and the criteria of French Impressionism, in order to attain a higher degree of truth and genuineness in both life and art. Gauguin's personal view of the “primitive” as the primordial power governing the world, as the fundamental essence of human nature, led him to artistically combine a vast range of figurative sources distant in space and time. 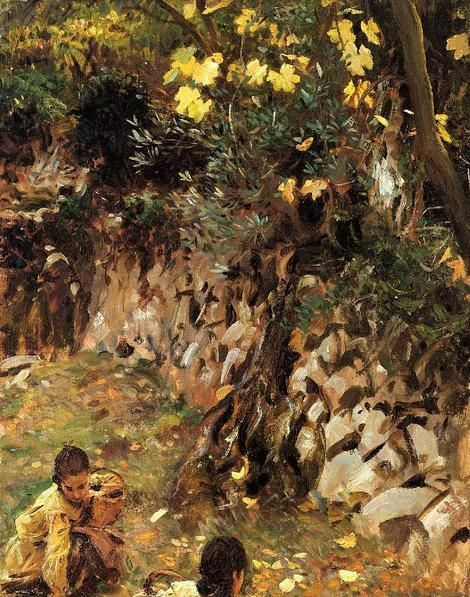 Alongside his initial interest in European medieval art, Gauguin was soon drawn to the search for something more authentic than contemporary European culture. 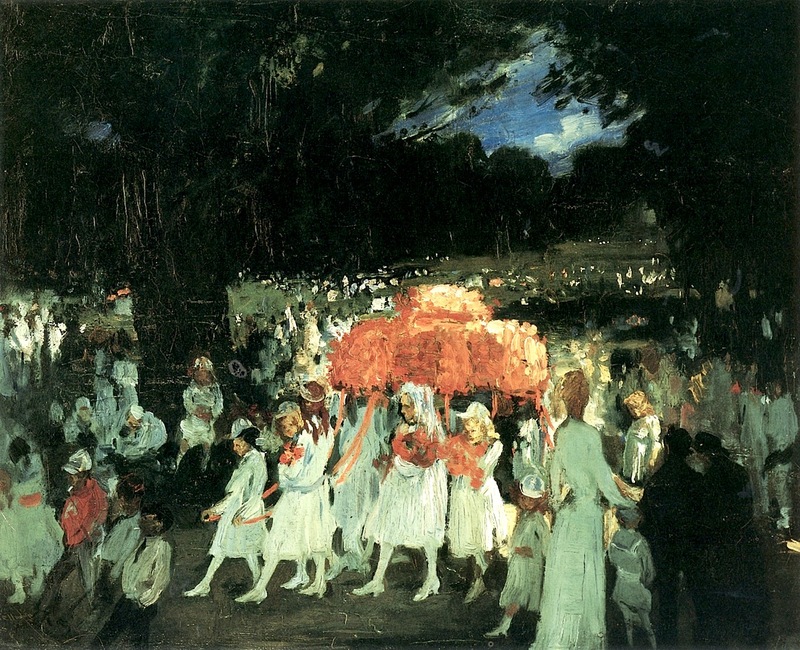 This urge led the artist first to Brittany, a land of age-old traditions and simple ways of life, and then to Martinique, an island with an exotic and pristine nature. Following his discovery of traditional artefacts from the French colonies at the 1889 Universal Exhibition, Paul Gauguin travelled further and further, reaching the islands of French Polynesia. Here he pursued his dream of leading a primitive, ancestral existence, in which art and life, symbol and vision, are combined into a single reality. “Gauguin. 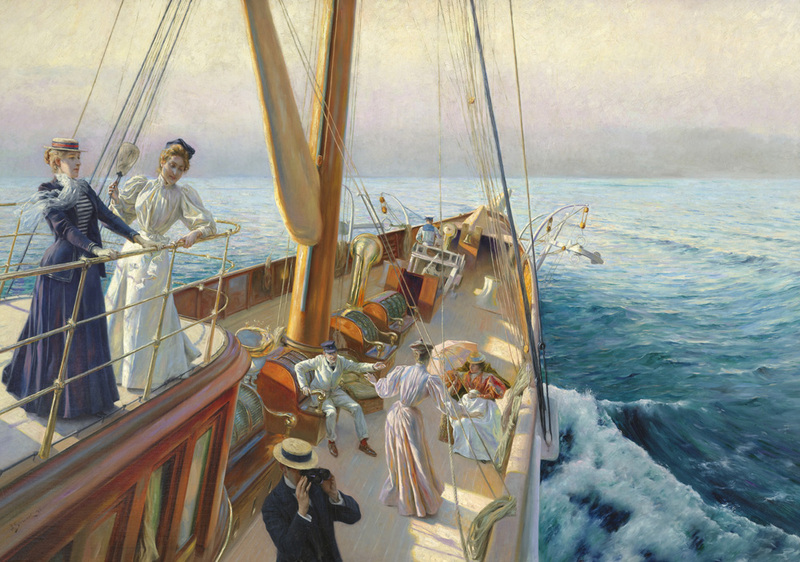 Tales from Paradise” is curated by Line Clausen Pedersen and Flemming Friborg, respectively the curator of the Department of French Art and the Director of the Glyptotek. 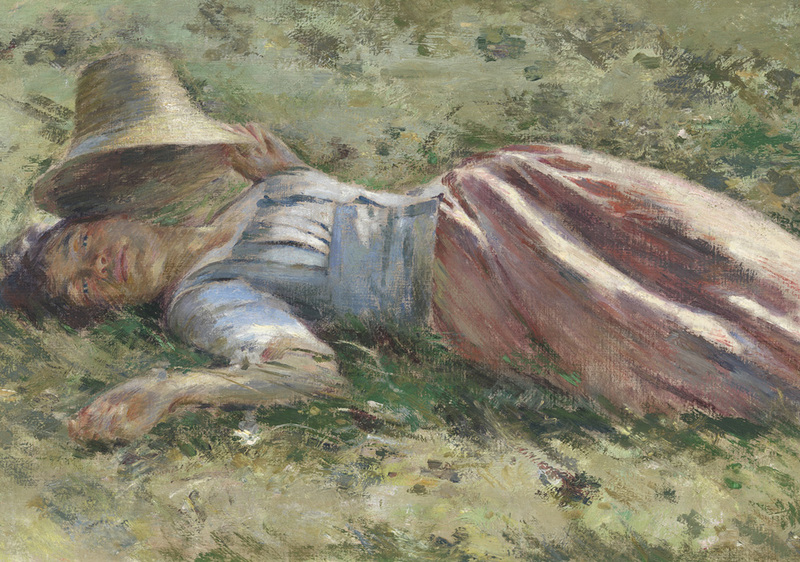 Represented in this sale are three generations of the iconic Wyeth family, with works from N.C., Andrew, and Jamie on offer. 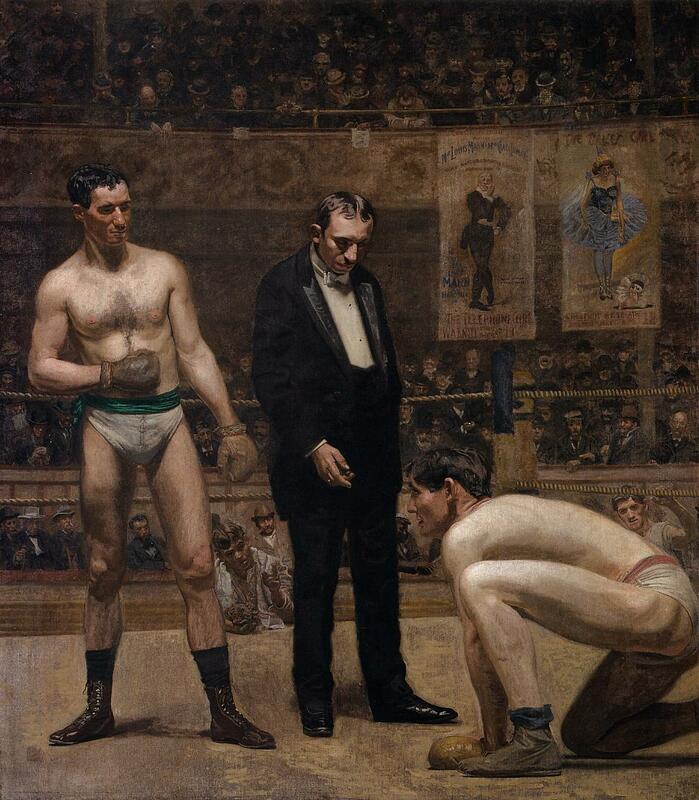 The distinctive genre of American illustrative art as characterized by Norman Rockwell and Maxfield Parrish is also featured in this sale, as are early American painters like Gilbert Stuart Artists and subjects of special significance to Philadelphia society (like the subject of Stuart's "Portrait of Anne (Nancy) Lee" ) and its rich artistic community (including Thomas Eakins) are peppered throughout the sale. Andrew Wyeth's "Winter Corn Fields" (Lot 81, Estimate $600,000 - 800,000) The work comes to auction from The Estate of Nancy duPont Reynolds Cooch, who had been a childhood friend of Wyeth's . "Every so often a painting comes along that resonates deeply, and for me, this is one," said Vice Chairman Alasdair Nichol of the work. 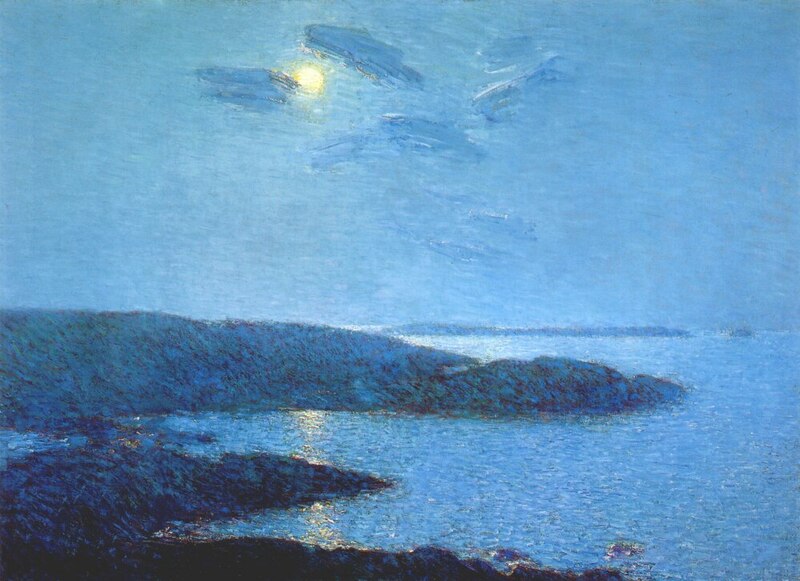 He went on to remark that "I consider this to be the most exciting period of Wyeth's career - he's just coming into his own and escaping his father's influence. This is six years before his masterpiece ' Christina's World,' and already we're seeing the symbolism he would become known for - that ominous, brooding sense of uncertainty. Once dismissed as merely commercial work unworthy of serious consideration , Illustration A rt is now enjoys a reputation as a vital and highly influential genre, with collectors clamoring for works by icons of the American "Golden Age of Illustration." 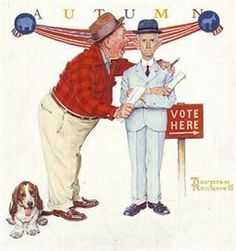 Two pillars of the style , Norman Rockwell and Maxfield Parrish, are represented in this auction. 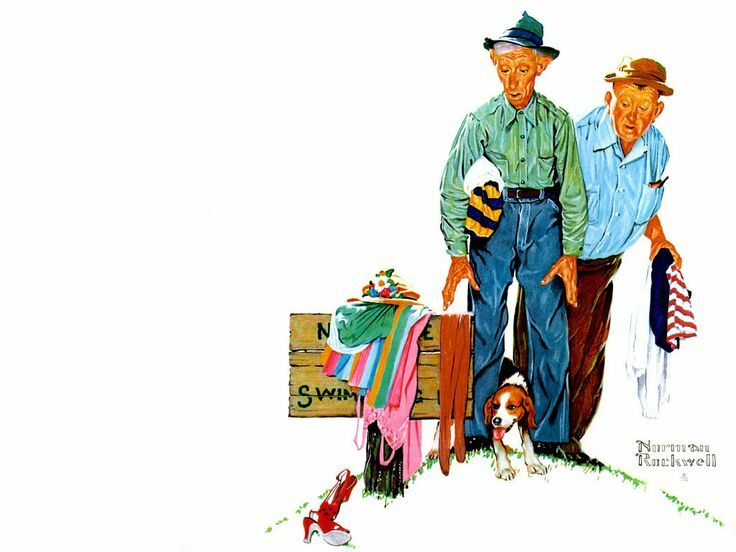 Arguably one of the most beloved of American artists, Norman Rockwell worked in opposition to the avant garde style of his contemporaries. Lots 36 - 39 in Freeman's December auction is a series of four pencil drawings, (Estimated at $60,000-$100,000 each) studies for oil paintings which appeared in Brown & Bigelow's Four Seasons calendar in 1950. 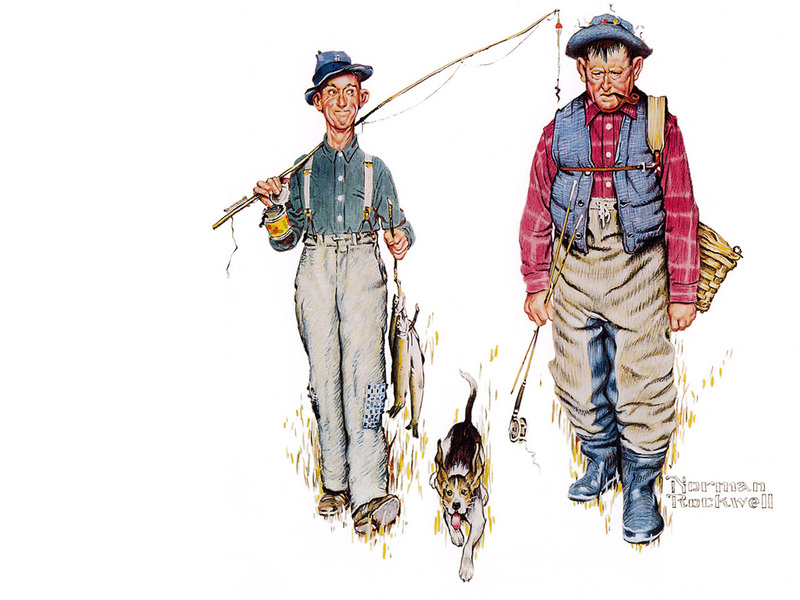 The illustrations depict the seasonal adventures of "Two Old Men and Dog ." Also highlighted in the auction are Gilbert Stuart and Thomas Eakins two early American artists with ties to Philadelphia . 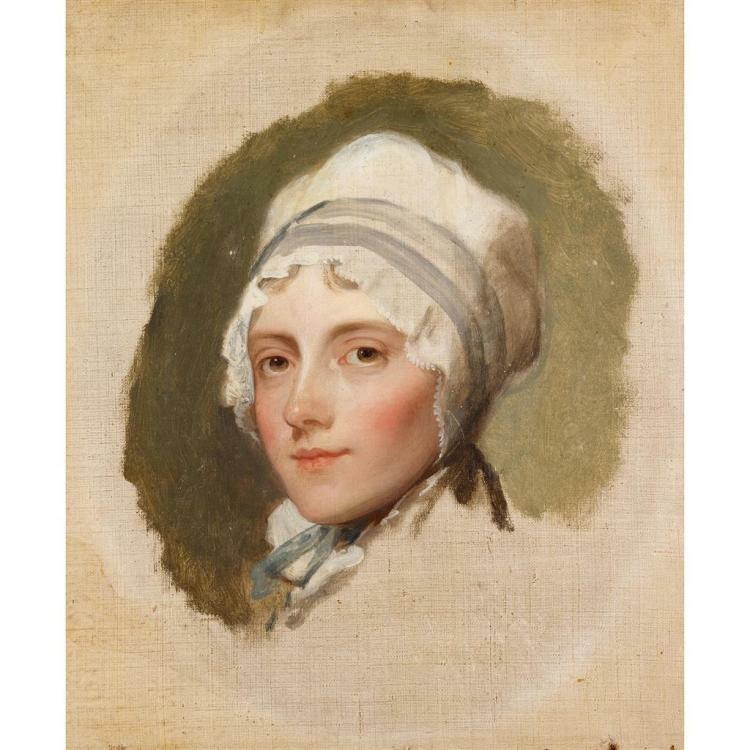 Stuart's "Portrait of Anne (Nancy) Lee" (Lot 6, Estimate $30,000 - 60,000) is sure draw attention from collectors of fine early American art and historical portraiture. 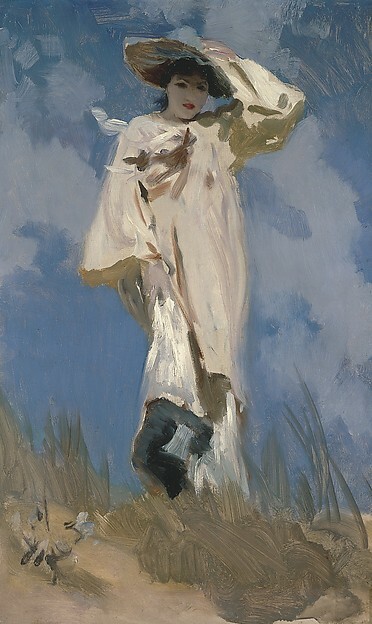 A favorite of Philadelphia society and a great beauty of her time , Anne Lee is depicted by Gilbert wearing a bonnet in the height of fashion. 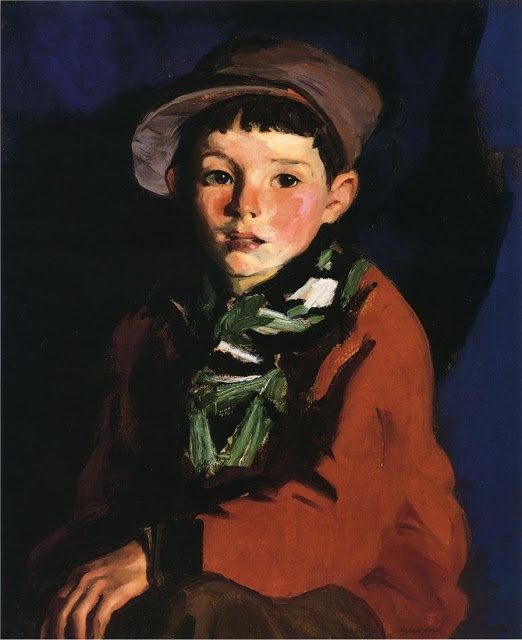 The portrait is unfinished ; it's bare, unfinished edges add to the overall charm of the work. 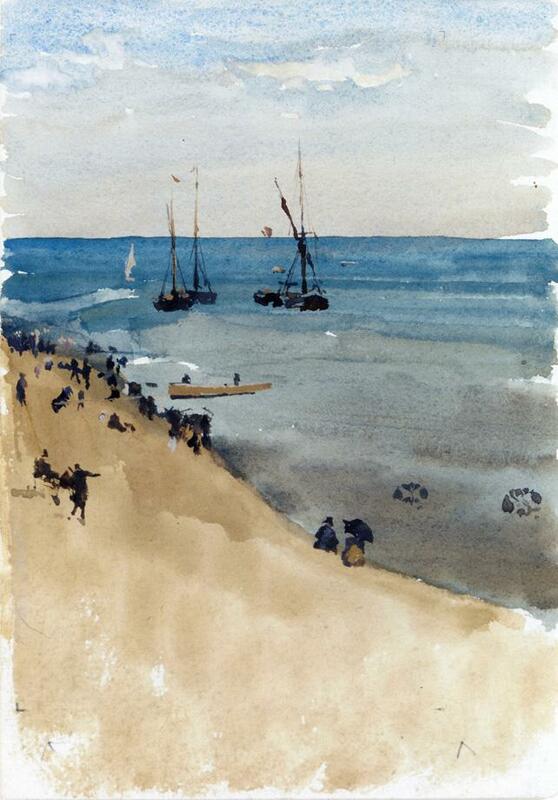 In a letter to the editor of Frank Leslie's Popular Monthly in 1896 , an admirer of the painting remarked that rather than finishing the work, Stuart "flung away his brush, exclaiming 'It breaks my heart to paint loveliness that must fade so soon!'" Whether or not this incident actually happened cannot be determined, but the story adds romance to an already enchanting painting. 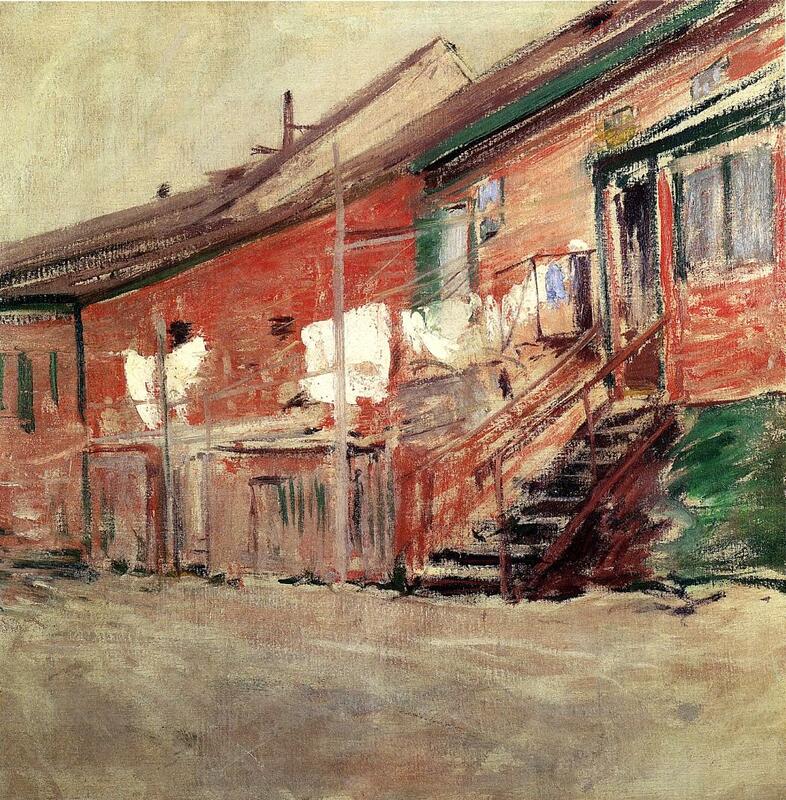 The great detail and effort Eakins places in this small subject are representative of the artist's meticulous nature. On 9th December this year, Sotheby’s London will offer for sale John Constable's The Lock -one of the small group of monumental landscapes, known as the 'Six Footers', which for many define the pinnacle of the artist's career. 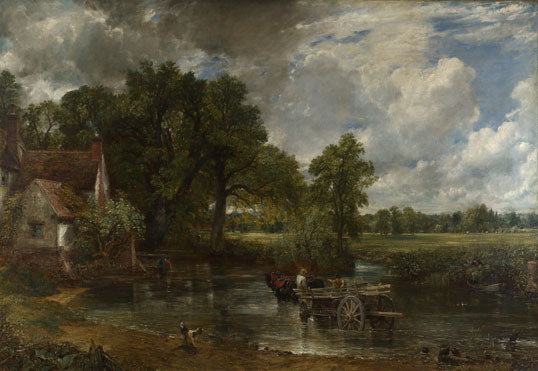 Depicting a bucolic scene on the River Stour in the artist’s native Suffolk, and painted in response to the huge critical acclaim that greeted Constable's first treatment of the composition (exhibited at the Royal Academy in 1824), the picture was treasured by the artist –retained by him in his studio till the end of his life, singled out by him for prestigious exhibitions, and chosen as the basis for the engraving that was to make it among the most familiar, and celebrated, images in the canon of British art. Having remained in the same family collection for over 150 years, it now comes to the market for the first time since 1855 with an estimate of £8-12 million. Major works by Constable are extremely rare in private hands. Of the other paintings forming part of the famous ‘six-footer series’ –the monumental Stour landscapes which rank among the most celebrated of Constable’s paintings –all but two are currently in public institutions. Indeed this picture is one of only three major paintings by Constable left in a private collection. Unlike his contemporary J.W.M.Turner, Constable did not achieve great commercial success in his lifetime. Critical acclaim and acceptance by the art establishment came late for him too. 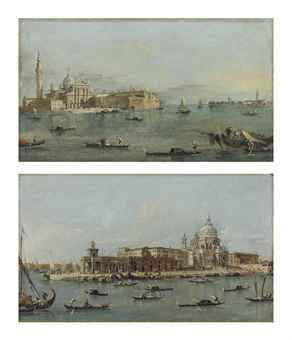 He was 54 before he was elected to the Royal Academy in 1829, so when, in 1824,the first version of The Lock was exhibited at the R.A. to huge acclaim, selling within moments to an illustrious and eager collector, it is perhaps not surprising that Constable immediately set about painting another version of the composition that had proved so successful. With The Lock, it seemed, he had found a composition that spoke both to his own, very personal and rigorous standards and that at the same time resonated with a hitherto largely uninterested public. Salisbury Cathedral from the Meadows of 1831, now in the Tate, London). 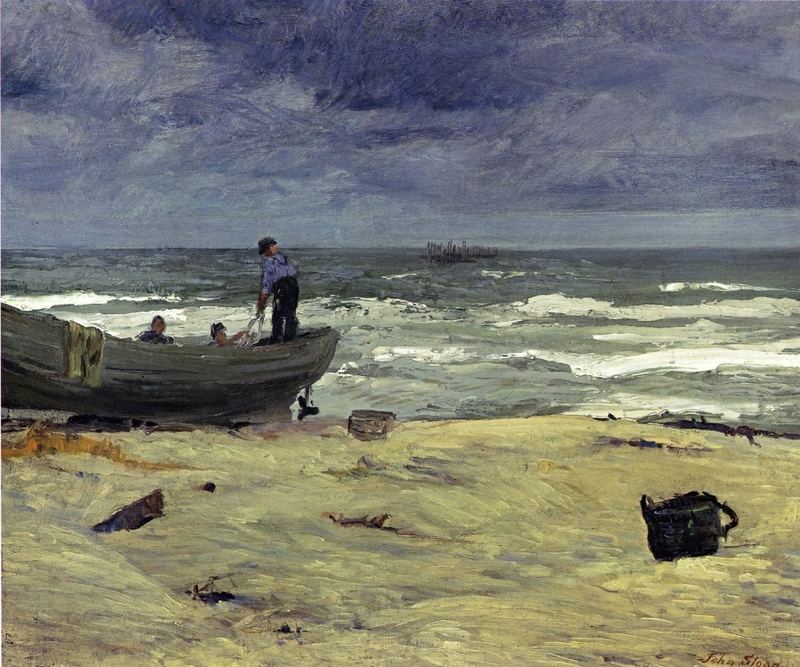 Constable remained deeply attached to this picture throughout his life. 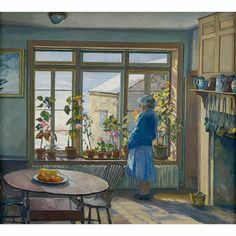 Possibly because for him it represented a ‘break-through’ moment, but also, no doubt, because of his deep affection for the landscape it depicts -the local area around East Bergholt which first inspired his imagination and made him a painter. His great satisfaction with, and affection for, the painting meant that he chose it both for major exhibitions (in Brussels in 1833 and in Worcester in 1834) and as the basis for the much-loved and widely circulated print by David Lucas. 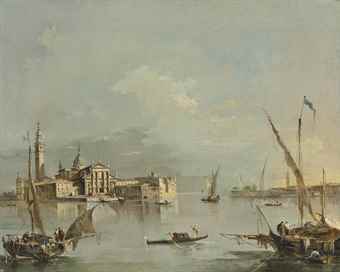 Christie’s Old Master & British Paintings Evening Sale in London on Tuesday 8 December 2015 will offer an exceptional selection of pictures from private collections, several of which have never before been offered at auction. Albrecht Dürer’s magnificent Hare of 1502, today in the Albertina in Vienna. One of Hoffmann’s largest drawings and greatest masterpieces, the present work can be seen as a paragon of the so called Dürer Renaissance, an intense revival of interest in Dürer’s work at the end of the 16th Century, about fifty years after the artist’s death. A hare among plants is not a direct copy but an inventive adaptation and variation of Dürer’s iconic Hare. Hoffmann represents the hare among plants while in the Albertina drawing the background is left blank. Every species is individualised and the artist excels equally at representing beautiful flowers in full bloom, lively insects, a lizard and a frog as well as faded, diseased, or pest-eaten foliage. Cobwebs and a faded dandelion and even a tick attached to the hare’s fur are drawn with extraordinary detail. 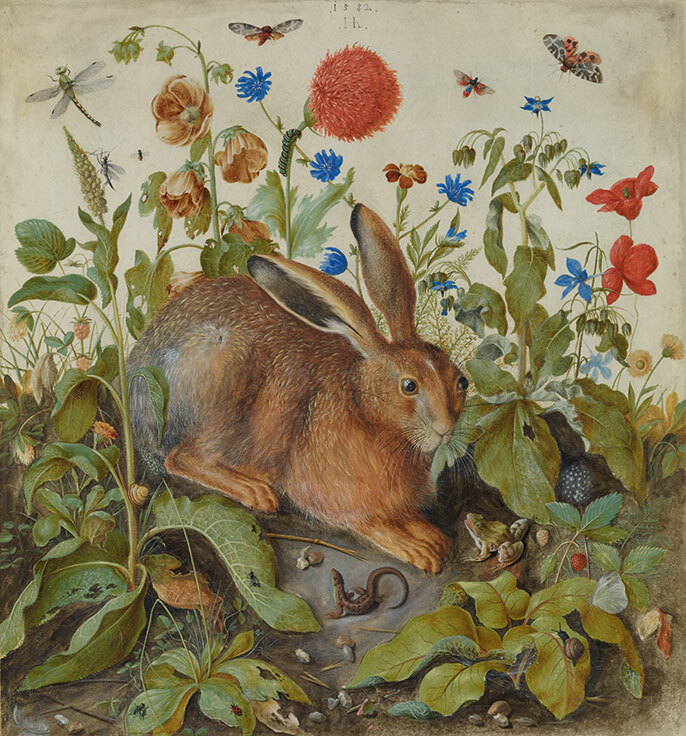 A hare among plants was part of the extraordinary collection assembled by Nürnberg born trading businessman Paulus Praun (1548-1616), very probably its first owner and the artist’s most important patron. After 1801 it was acquired by Johann Friedrich Frauenholz, Nürnberg, and after 1945 sold to the Stapf family in Tyrol, from where it was acquired in 1975 by the father of the present owner. Christie’s is proud to be able to offer international collectors the rare opportunity to acquire a technical tour de force in remarkable condition, which stands as a perfect embodiment of the Dürer Renaissance, a movement that lasted not more than twenty years but certainly helped fix the perception of Dürer’s work and affected the way in which succeeding generations were to receive him. 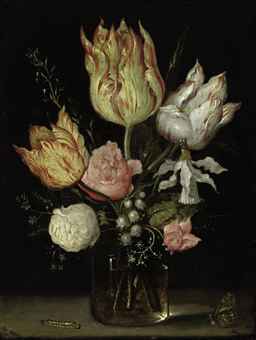 From Ambrosius Bosschaert the Elder (1573- 1621), who along with Jan Brueghel the Elder and Jacques de Gheyn was the pioneering founder of European flower painting, Christie’s will offer a hitherto unknown, jewel-like panel (estimate £600,000-800,000), which constitutes a significant addition to the artist’s small oeuvre, of some seventy accepted works. 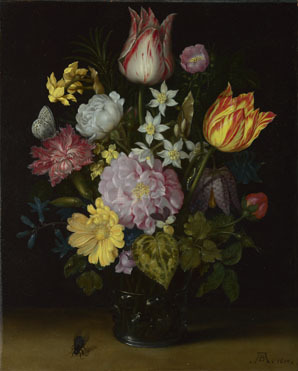 Despite the seemingly anecdotal nature of its subject, Bosschaert’s still lifes encapsulate the two key transformations of the early modern era: the dawn of the scientific age, marked by a new curiosity and inquisitiveness about the natural world, and the discovery of the Americas, which resulted in the arrival of a series of exotic plants in Europe. This painting is an archetypal work of Bosschaert’s maturity, when he was able to orchestrate a substantial number of flower species into a relatively small space while creating a real sense of volume, movement, and tonal harmony. At the heart of the picture is a mature rose, soon to crumble, beautifully framed by a group of lively narcissi, a delicate viola and an exuberant red and white carnation Bosschaert’s subtle modulation of light creates a remarkable sense of depth and by setting the crisply designed and meticulously painted flowers against a dark background, he generates a stark contrast of patterns and colours that proves strikingly modern. one of Bosschaert’s masterpieces dated from 1614 now in the National Gallery in London. According to Fred Meijer of the RLD, who dates the present panel to the same year, the two pictures were probably painted side by side, a common practice for Bosschaert who would sometimes repeat his most accomplished compositions. Parrot tulips, a rose, a fritillary, daffodils, narcissi and other flowers in a roemer, with a Meadow Brown butterfly and a fly, on a stone table will be offered from a private collection. 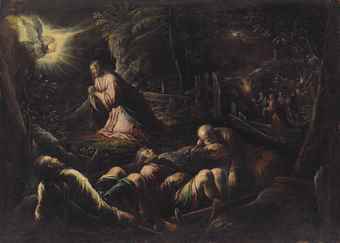 Also offered for sale at auction for the first time is an exceptional nocturne, The Agony in the Garden, by Jacopo Bassano (1510-1592), (estimate £500,000-800,000). 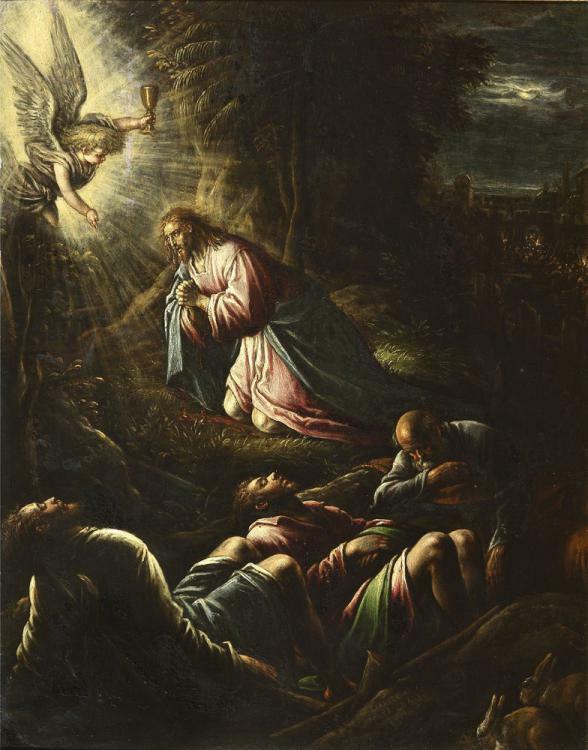 Bassano was a contemporary of Titian and Tintoretto and was hugely influential on El Greco. This picture, which was first published in 2004, dates to the 1570s and is a key example of Bassano’s speciality and talent in depicting nocturnes. 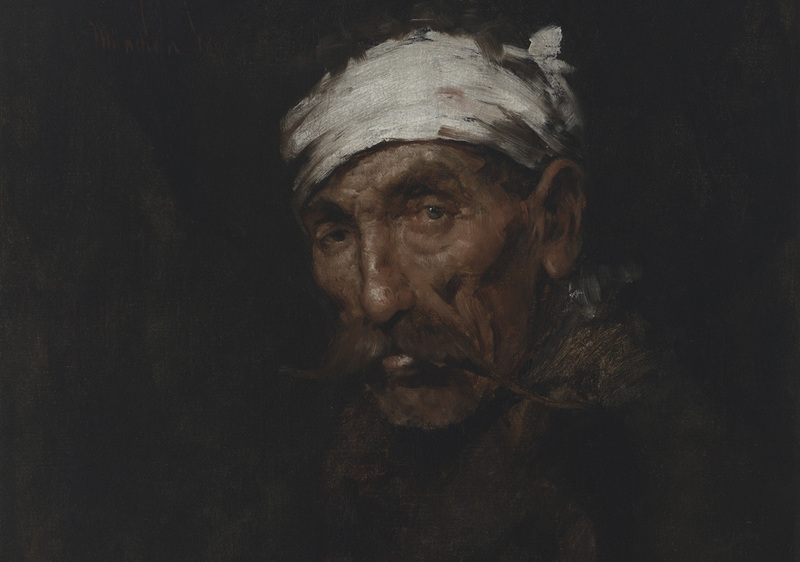 It has previously been on loan to the Museo Civico in Bassano, the artist’s hometown, and was included in an exhibition at the Louvre, Titien, Tintoret, Véronèse, Rivalités à Venise, in 2009-2010. 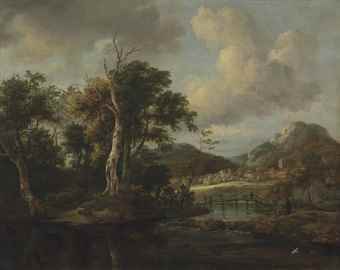 Jacob van Ruisdael's (1628/9-1682) A wooded river landscape with figures crossing a bridge is offered for sale for the first time in over 100 years (estimate £250,000-350,000). 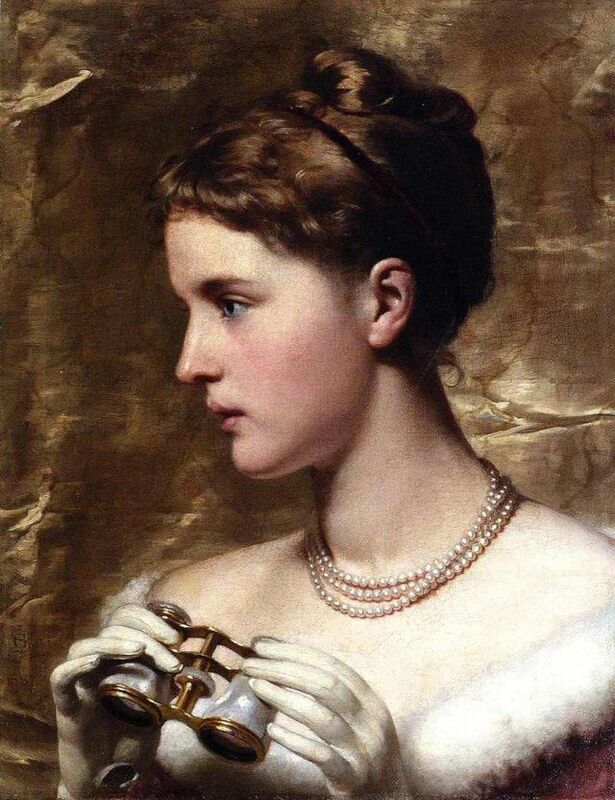 It was once part of the collection of Alexander Hugh Baring (1835-1889), 4th Lord Ashburton, of the legendary Baring dynasty of bankers, philanthropists, and art collectors. Ashburton’s collection included paintings by Greuze and Weenix now in the Wallace Collection and Murillo’s The Infant Saint John with the Lamb today in the National Gallery in London. The reappearance of this picture, known through an engraving, but untraced since it was sold in Paris in 1879, returns one of Ruisdael’s celebrated wooded landscapes to his documented oeuvre. This classic subject by the greatest landscape painter of the Dutch Golden Age depicts a transitional space, where the wild forest and the cultivated cornfield and nearby hamlet meet. 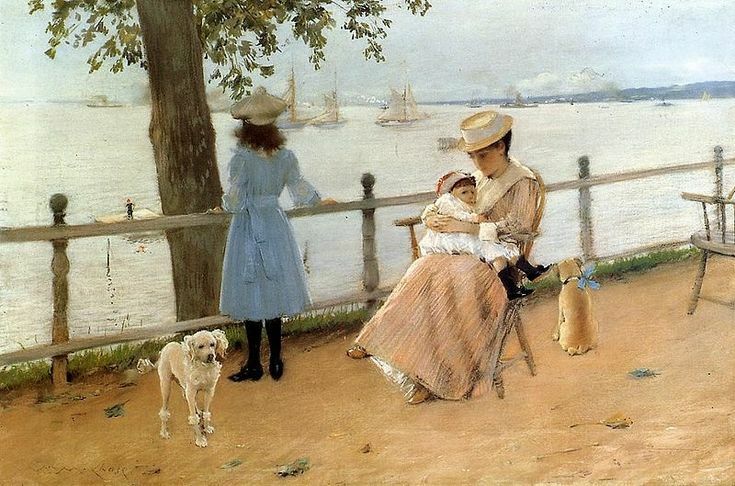 From the Baring collection the painting went to the collection of Max Kahn in Paris before entering the collection of Léon Emile Brault (1825-1910) in 1879, in whose family it has remained ever since. Santa Maria della Salute with the Dogana di Mare (detail) (now Norton Simon Museum, Pasadena) can be dated, Guardi gradually developed his technique to what was to become his most admired style; the brushwork became looser and freer, his palette lightened and his images softened into a suffused pale glow. at a Christie's auction in 2012.
and a fine version of the Birdtrap by Pieter Brueghel the Younger (estimate £1-1.5 million). The panel is closely related to one of Bosschaert’s masterpieces dated from 1614 now in the National Gallery in London. According to Fred Meijer of the RLD, who dates the present panel to the same year, the two pictures were probably painted side by side, a common practice for Bosschaert who would sometimes repeat his most accomplished compositions. 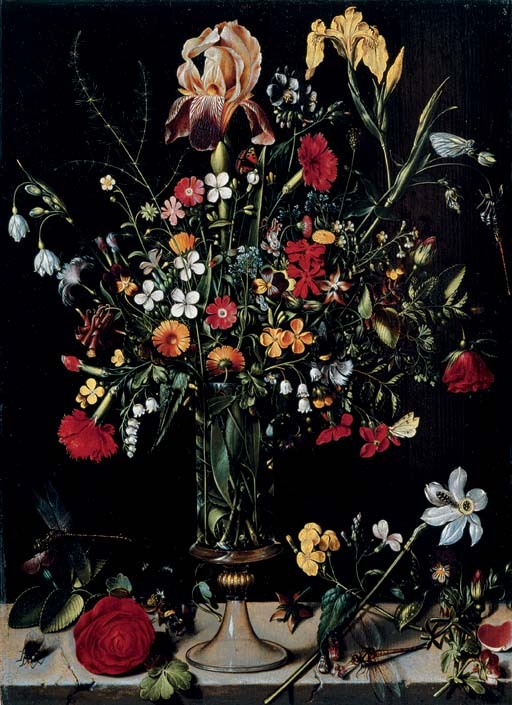 Parrot tulips, a rose, a fritillary, daffodils, narcissi and other flowers in a roemer, with a Meadow Brown butterfly and a fly, on a stone table will be offered from a private collection. 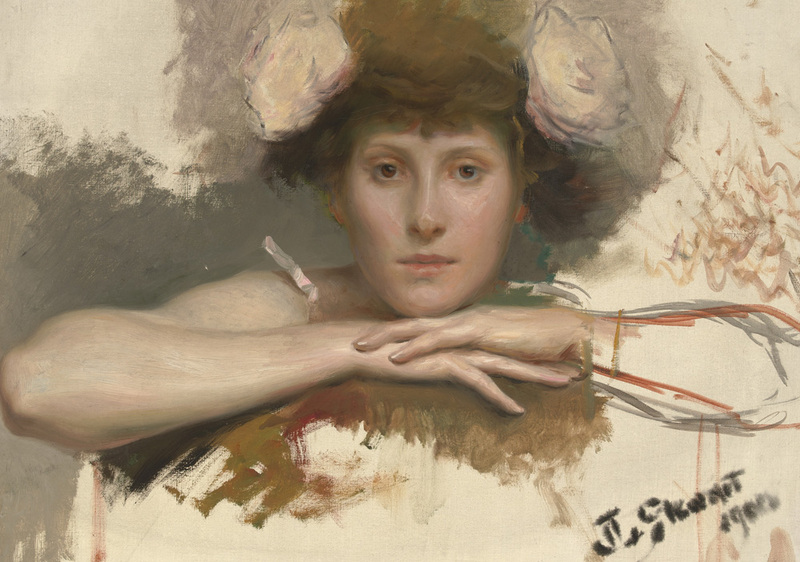 Longtime patrons James W. and Frances Gibson McGlothlin have given their collection of 73 works to the Virginia Museum of Fine Arts for permanent installation in the McGlothlin American Art Galleries. 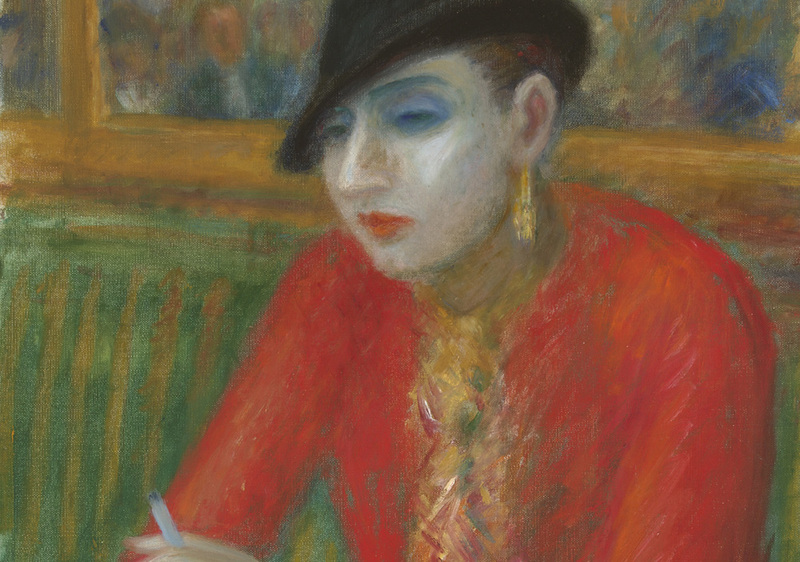 The value of the McGlothlin Collection exceeds $200 million and will open to the public on November 24. VMFA Director Alex Nyerges said: “The McGlothlins’ unexpected gift is a magnanimous gesture of national importance. 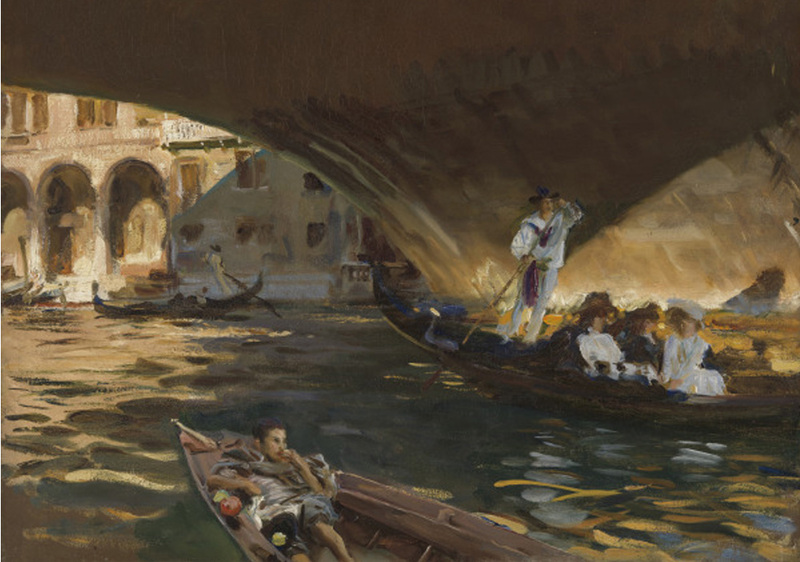 These works greatly strengthen our American collection with 12 artworks by John Singer Sargent, five new Bellows and 56 additional major works for visitors to enjoy. Twenty of these works have not been exhibited at VMFA before and the breadth of the new collection will add appreciably to VMFA’s American holdings. 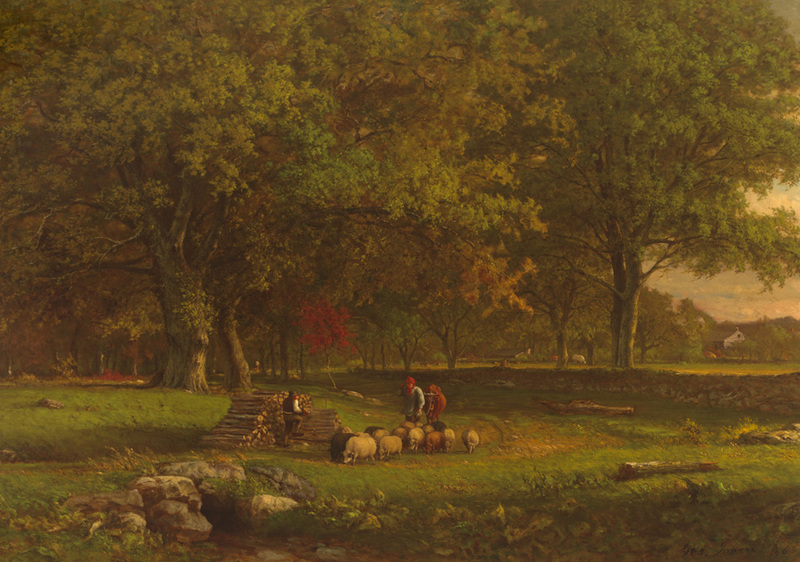 Spanning the formative century from 1830 to 1930, from the Hudson River School to Modernism, it is one of the most important collections of historic American art in private hands and will contribute significant depth to VMFA’s collection from this period, said Susan J. Rawles, PhD, VMFA’s associate curator of American painting and decorative art. 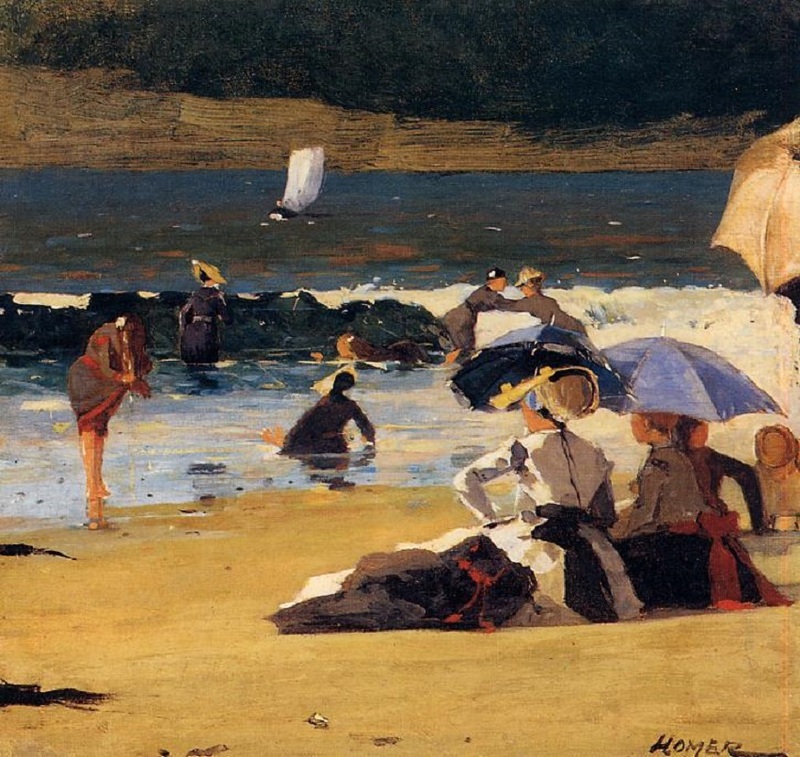 Renowned artists include Childe Hassam, John Singer Sargent, George Bellows, James A.M. Whistler, and Mary Cassatt, among others. 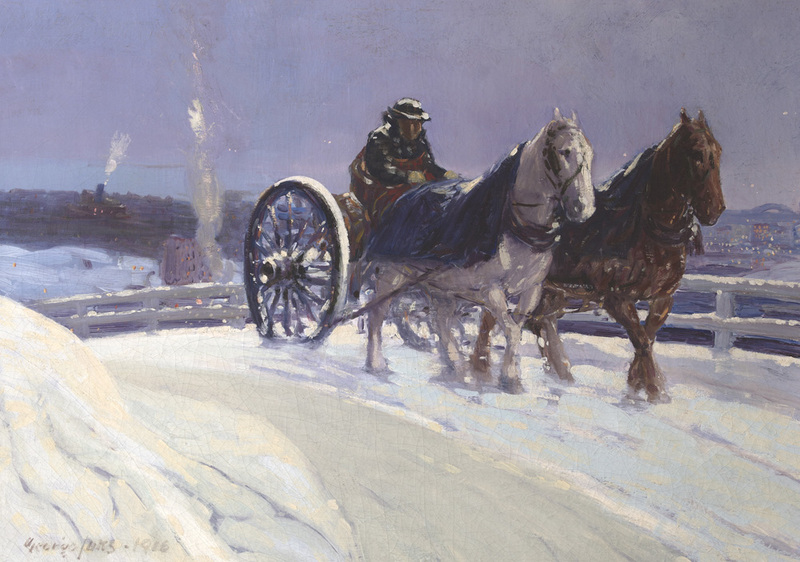 Such a historically representative and significant collection of American art has not been gifted to a North American museum in more than 30 years. 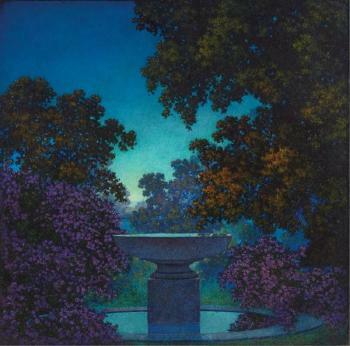 In 1985, David and Eula Wintermann gave more than 50 American paintings dating from 1880 to 1925 to the Museum of Fine Arts, Houston, providing a foundation for the development of that collection. 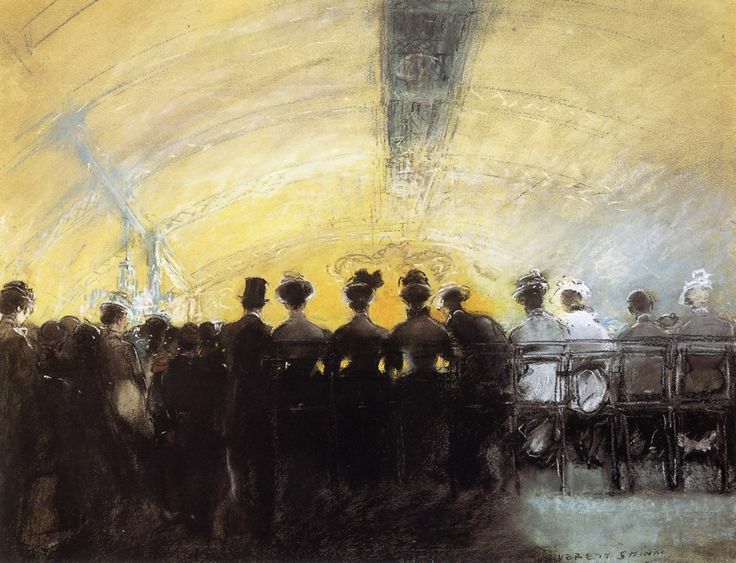 The expansive historic scope of the McGlothlin collection will be reflected in the installation, where visitors will encounter broad themes, including Westward the Course of Empire: American Landscape, The Gilded Age of Realism and Impressionism, and All That Glitters Is Not Gold: Modernism. 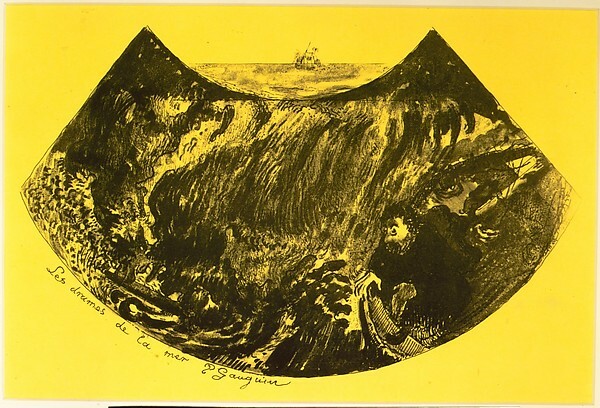 During the same year, the McGlothlins promised to bequeath their collection to VMFA. In addition, they made a $30 million gift toward the museum’s 2010 expansion. The result is the 165,000-square-foot James W. and Frances G. McGlothlin Wing. William Merritt Chase’s Wounded Poacher (1878). 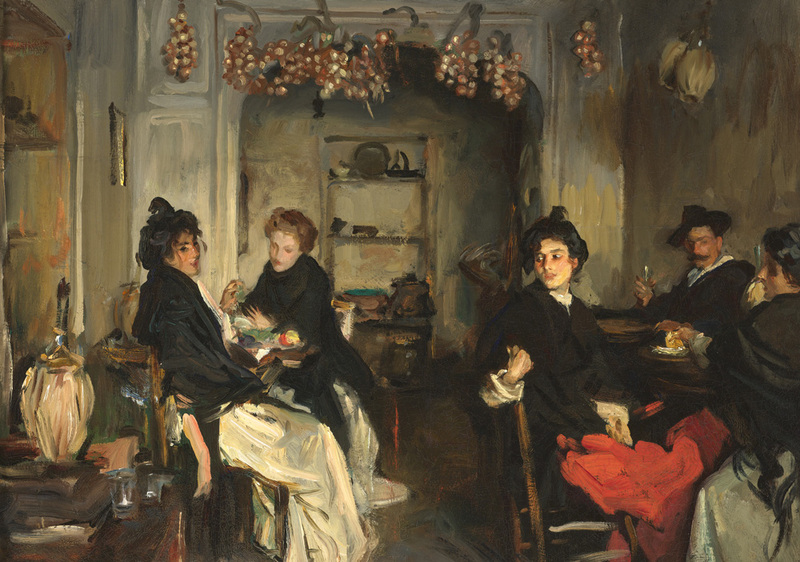 A second exhibition of more than 70 works from their collection, Private Passion, Public Promise: The James W. and Frances G. McGlothlin Collection of American Art, coincided with the museum’s reopening. 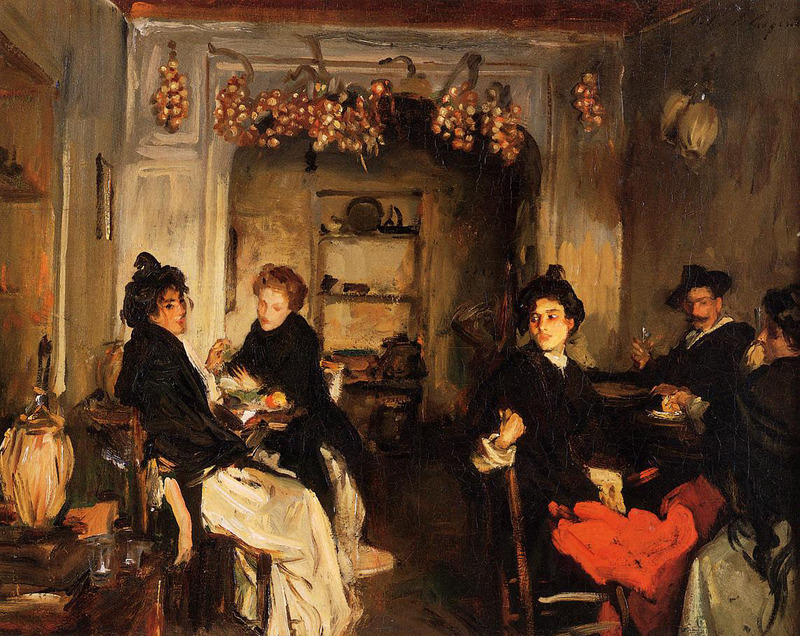 In December 2014, they made a second gift of art to VMFA, John Singer Sargent’s The Rialto (1909). Jim McGlothlin is chairman, CEO, and the sole owner of The United Co., a 44-year-old Bristol, Va., company that sold its coal mine holdings for an estimated $1 billion in 2009 to the Ukrainian firm Metinvest. The company’s businesses interests — which over the years have included coal, steel, oil and natural gas, a cogeneration plant, roofing materials, and pharmaceuticals — now are focused on financial services and golf courses. Jim serves on the boards of the Virginia Museum of Fine Arts, the Mountain Mission School, and the PGA Tour. Jim is a current member of the VMFA Board of Trustees and serves on the Executive Committee. Fran McGlothlin served on the VMFA Board of Trustees from 1998-2008. While on the VMFA Board of Trustees Fran was a member of the Art Acquisitions Sub-Committee and the Director’s Search Committee in 2006. The couple has three children and six grandchildren. 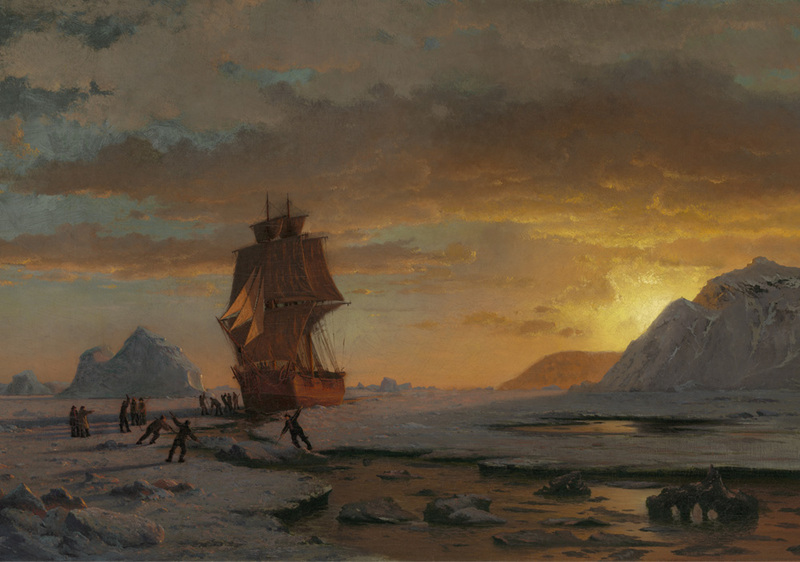 VMFA’s permanent collection encompasses more than 33,000 works of art spanning 5,000 years of world history. Its collections of Art Nouveau and Art Deco, English silver, Fabergé, and the art of South Asia are among the finest in the nation. 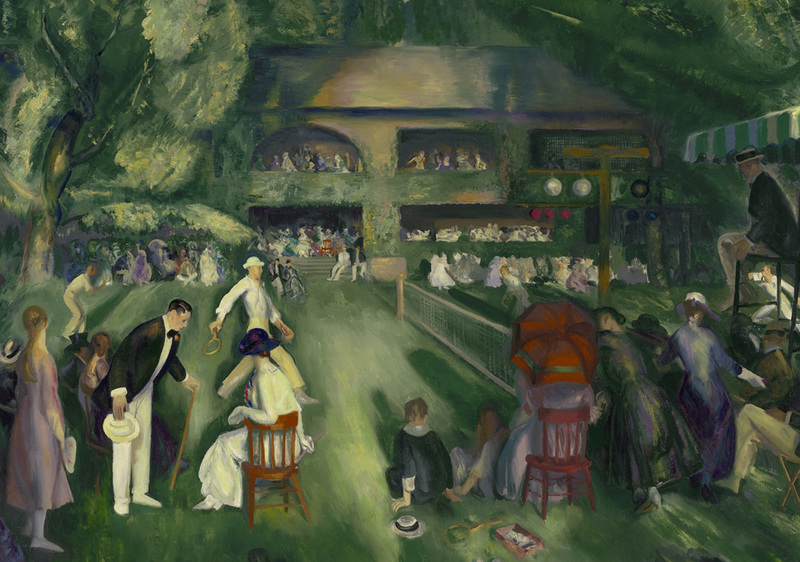 With acclaimed holdings in American, British Sporting, Impressionist and Post-Impressionist, and Modern and Contemporary art – and additional strengths in African, Ancient, East Asian, and European – VMFA ranks as one of the top comprehensive art museums in the United States. Programs include educational activities and studio classes for all ages, plus lively after-hours events. VMFA’s Statewide Partnership program includes traveling exhibitions, artist and teacher workshops, and lectures across the Commonwealth. VMFA, a certified Virginia Green attraction, is open 365 days a year and general admission is always free. 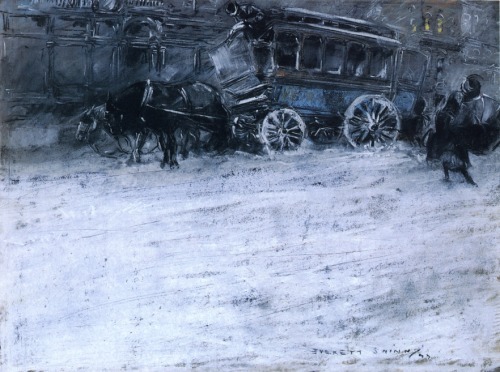 Signed and dated: "Blum - 89"
Signed, dated, and inscribed: "Dennis M. Bunker -/ Lamour - 1884"
Signed and dated "F. Frieseke 1901"
Signed and dated: "Hassam 1907"
Inscribed on verso: "C. H."
Signed, inscribed, and dated: "Childe Hassam Paris 1889"
Signed and inscribed on verso: "Robert Henri 181/M Listening Boy"
Signed and dated: "Homer 1892"
Signed and dated: "Homer 1879"
Signed and dated: "Paxton - 1908"
Inscribed, signed, and dated: "To Madame Baudy/ Th. 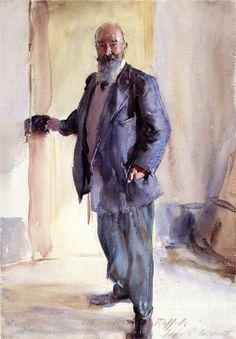 Robinson 1888"
Inscribed and signed: "all' amico A Raffele John S. Sargent"
Signed and dated: "Everett Shinn / 99"